We recently held an AMA with the Fantasy New Content Team over on the Total War Reddit with lead designer Richard Aldridge, DLC designer Mitch Heastie, and brand director Rob Bartholomew – check out the highlights below. Will the next DLC come with another rework for an Old World faction? Rich: I’m happy to say yes, the next campaign pack will come with another rework to an Old World faction. Which one it is I can’t say at this time – and potentially it may not be the one that you are most hoping for – but rest assured that the New Content Team will endeavour to give the old factions a fresh lick of paint at some point and certainly give you something new and hopefully exciting to play with. Have you ever considered cross-game DLC for WARHAMMER II? Rich: Absolutely, there are some very iconic clashes between characters of the new and the Old World. With development currently focused on WARHAMMER II, has the door permanently closed on more content (paid and free) for WARHAMMER I factions? Rich: So currently you are absolutely right, we are focused on adding more content for WARHAMMER II races and getting the Lizardmen and Skaven on a par with Elves in 2019. But we are very much aware that there are a fair number of missing characters and units for the WH1 races, both main game and DLC, some of which we would love to be able to add in the future if and when appropriate. What lessons have your team learned from designing and implementing race pack DLC? And, in particular, how have you carried these lessons over to current/potential future projects? Mitch: Well I guess firstly making distinct factions has taught us that having distinct factions in the game makes the world of difference, and I’d say its the top of pyramid of design focus for everything we do now. We know people look back at old content and see the newer stuff as sometimes superior, and I think that basically answers your question, we learn in all areas of the content we make about what people like and dislike after every single DLC, we’re always improving and changing. How do you guys address the issues of power creep when creating new factions/units? Rich: So as you will have seen from WARHAMMER I to WARHAMMER II, we have become more adventurous in our designs (battle and campaign) and this in turn has affected the balance of the game and understandably introduced an element of power creep to the game which we are aware of and it is something that we want to address. With Total War: Warhammer being an ever changing and organic game through its various updates, we are in a good position to go back an adjust the content, hopefully correcting the balance as you will have seen in some of our updates. But we intend to continue this support bringing up any older races or particular units to a par with the new things we are adding. Asymmetric design certainly throws up a good about of challenges, but they are ones that we are happy to tackle and hope that you agree this is what makes Warhammer so unique and fun to play. I loved the rework of the Runeforge with the Dwarfs. Are we likely to see some other mechanic reworks in a similar spirit? Rich: The Runeforge is a perfect example of where we can really add mechanics in a cost-effective manner. The primary cost of the crafting system was in Tomb Kings, so when we see easy wins like then adding that for Dwarfs, we will try to do so. Are naval battles ever going to be added or should I just let that dream go? Mitch: We’ve said on a few occasions that our focus is going to be the land battle aspect of the game. It’s what the tabletop is, and it’s what we want to be able to put 100% of our effort into. Naval battles would be a HUGE time investment. We are 100% aware of people’s frustrations with the current gameplay related to oceans. What’s mechanics you aim to improve in future DLCs? Rich: My top two personal things I want to change are the Chaos Invasion and Wood Elves Amber. This is absolutely not any indication either will change, but those two stand out to me as the top two “not working as intended” features that I personally would like to rework. What specifically do you think needs to be changed in that? Mitch: Amber to me was always a bit contradictory in its design, outposts were always meant to be expendable, but that’s unfair when at the same time you’re told if you don’t hang on to them you don’t get to have the resource you need to do everything else. I’d like to toy around with making the Amber you gain from outposts a onetime gain from each region. You’ll still need to go out from your forest to different areas of the world, but you won’t need to maintain a giant Empire of indefensible outposts. Can we expect more global or semi-global mechanics in the future on the campaign map like the Sword of Khaine? Mitch: We’ve seen the feedback from what is essentially one of our first “global” mechanics, as you put it. We’re definitely aware of the fact people liked this. Are there any plans to update the Army Skills for Old World Lords to the new format introduced by WARHAMMER II? Rich: We are aware of the disparity between the WARHAMMER I and WARHAMMER II Lords skills and it is something we have on our radar to address in future updates. With how badly player intervention armies perform versus the AI factions, what was the thought process going forward with the blood voyages as a game mechanic? Currently all of these armies and Waaagh/Brayherds are more of a ball and chain on the player’s foot than beneficial. Is this intended or a consequence of more recent design decisions? As a sort of side note, I think all minor factions are currently far too weak versus majors in AI versus AI combat. I agree that major factions should have a small bonus, but I think it’s currently far too much in their favour. Mitch: One thing we know for sure from our years of making Total War games is that people want the major factions and characters to survive and do well, especially so in WARHAMMER. Our primary way of doing that is autoresolve bonuses for certain factions when facing minors as you mention, that can lead to issues like you describe where a minor faction like an intervention runs into a major faction and loses. It’s something we’re looking at – balancing a Total War campaign is a monstrous task, where any tiny change can have huge knockons at any point in a massively long campaign, it’s almost impossible to do without things like bonuses, and naturally some people will think these methods are crude but they are really the only way to get effective results. What are your thoughts on victory conditions as a whole in WARHAMMER? Mitch: Victory conditions is something we’re not happy with for sure, we’re looking at them currently. Personally, what do you consider to be your most successful or your personally most loved game mechanic that’s been implemented to date in the Total war series? Mitch: Tomb Kings unit caps is probably the one I’m most happy with, that coupled with the upkeep gameplay I think worked really well personally, and I’m quite proud of how it all turned out. Over the past few months, modders have managed to introduce several features the community has been requesting for a while. These features include: Tiered Tax Systems, Region Trading with Allies, Legendary Lord Confederation Respec, and even an Army Painter! Does CA have any plans to eventually support some or all of these features officially? Rich: Regarding the mods, we love seeing what you guys and girls come up with. I have been particularly impressed with how inventive the mods have become, with many recent ones having really high production values with bespoke UI, so keep them coming. But in answer to your question, sometimes modders and us devs have very similar thoughts in seems ;0), in recent times the Dwarf Forge being a good example of this, so who knows for the future maybe you might see one or two more features making it into the game that are similar to mods out there. More Southlands in mortal empires (more Africa and South America). Any time I play a faction that is set in the southlands, (Teclis, Skrolk, Mazdamundi and ESPECIALLY Krog-Gar) I feel like I have to play Vortex since there is so little to conquer in your initial area in Mortal Empires. As someone who loves Lizardmen, this honestly hurts even more than the brutal wait for new Lizardmen content. At least with that I expect it will be well-developed when it finally arrives because of how long it’s taking. Rich: There are a lot of technical restrictions to consider for our campaign, the map is now so big that there are numerous things we need to account for like memory, turn times, etc. In this case what you describe is a choice we had to make to make things fit within our current situation, there’s no easy way around it. Hidden Quests in Mortal Empires Many legendary quest items (armour of midnight, heart of avelorn, etc.) are fairly easy to access in the vortex campaign. But, accessing them in mortal empires seems much more difficult. Some clarification on how to get them in mortal empires would be appreciated. Rich: We’re aware of these issues and I’ve seen them pop up a lot lately on Reddit so I’ll make sure to sort it out for the next release. Lizardmen Landmarks. Having just recently finished an Empire campaign and having played a lot of high elves, I have been struck by just how much better some factions landmarks are than others. The Lizardmen have a decent number of landmarks. But, they just seem significantly less useful than others. Itza and Hexoatl have good landmarks, and The Golden Tower of the Gods isn’t bad. (Although, it’s the only LM landmark in Africa, even in Vortex!) The rest are forgettable though. They just don’t seem to stack up to what the Empire, Dwarves, Dark Elves, and High Elves seem to have in the landmark department. I’d love some improvements here. All that being said, I’m really happy with what I’ve seen so far in the new landmark department. I’m just hoping for more. Keep up the good work! Rich: Landmarks are one of the areas we need to do a lot of balancing I feel. Some are OP, some are underwhelming, we need to bring them all a bit more inline I think so more specific feedback like this is fantastic for designers reading Reddit! Will the older WARHAMMER Factions be getting any other future updates such as the Empire factions? If so, what can we expect? Rich: Yep, we are looking to go back to the older factions and give them some love where and when we can, we are all Warhammer nerds here each with an itch to scratch in getting our favourite race fully kitted out with cool stuff. Our plan at the moment is to address each race individually for new major features or start positions. You will however see us updating other bits of content across the board with our standard patching process. Are there plans for a Southern Realms and/or Kislev DLC faction pack? Rich: We are always planning on how to make this the most rich and colourful Warhammer game out there. Fear not you will be the first to hear from Grace when we announce any new content for the game. Is new Legendary Lords out of the question for Old World factions? Additionally, are there plans to continue adding DLC to the older games, similar to how ROME II is still receiving DLC? Rich: They are certainly not out of the question, but we are currently focused on adding more Legendary Lords for WARHAMMER II races so that all have a great suite of options to choose from. 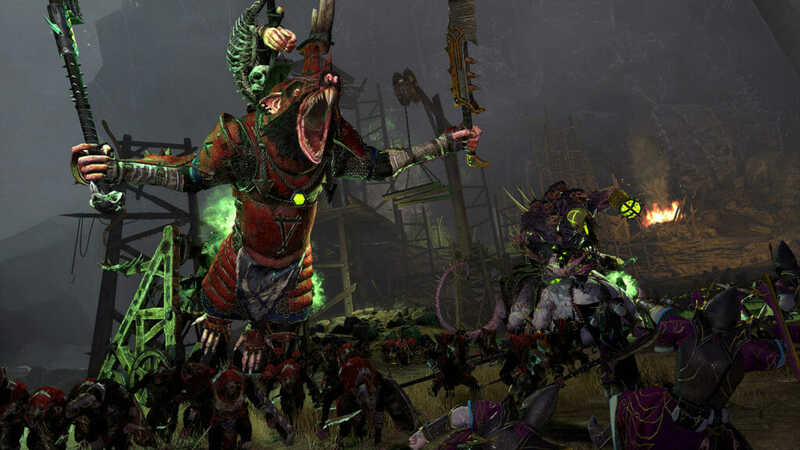 At the moment we are solely focused on delivering the best possible experiences to WARHAMMER II through the Vortex and Mortal Empires campaigns. This includes any updates and possible future reworks to WARHAMMER I characters and races. The WARHAMMER II code base allows us to push the boundaries on our designs which weren’t possible in WARHAMMER I’s code base, hence why we want to stick here for now and make more exciting new content. Does this mean that updates for WARHAMMER I races are most likely to happen only in the later games similar to the last Dwarfs update? Are the missing units from earlier game armies ever likely to come into the game? I’m thinking particularly the Beastmen units like the Jabberslythe. Rich: We are very much aware of certain characters, units missing from the game. With us all being total WARHAMMER nuts here in the office we would love to add as many of these to the game in the future if the right opportunity presents itself to us by the time the trilogy is complete. So far what is the policy regarding armies without published army books? Is Norsca going to be a one-off or can we expect more factions that didn’t have army books? Mitch: Just like Norsca shows, nothing is discounted straight away because of a lack of books. I loved the rework of the Runeforge with the Dwarfs. Are we likely to see some other mechanic-reworks in a similar spirit? Are there any new units you’re hoping to get added to factions? Which one is your favourite? Also what is your favourite faction to play as and why? Rich: Hey, thanks. It’s great to hear you enjoyed the Runeforge. We are very much looking to see how and where we can spruce up the old WARHAMMER I races. The next campaign pack update will be featuring another update to an Old World faction like the Dwarfs had. If I could I would add everyone unit and character to the game, we certainly try and cram as much new stuff in with each pack. Of what is still to come there are just too many cool things, but I think my favourite unit is in the forthcoming campaign pack and I hope you will think it’s pretty cool too. But from the current pool of units I really like the Doomwheels, if you have ever seen me on a stream you will see I just love driving them around the battlefield causing as much carnage as possible. In tabletop it’s the Lizardmen for sure – who doesn’t love a dinosaur riding a dinosaur shooting lasers from a mystical crystal. But in our game, I would have to say the Norsca – I love the brutal nature of them and the ability to get stuck with a host of big monsters and angry marauders fuelled on destruction. A subject of passionate debate on this forum is the possibility of “background factions” (those who did not have army books) getting represented in the game. My question is where do these background factions stand in terms of your considerations and priorities? Do you consider their inclusion a realistic possibility or are they totally not being considered in your development plan? Mitch: We consider everything. Obviously there are priorities – we’re aware of what the core stuff is for sure, but nothing is out of the question. Just look at Norsca with no book, Bretonnia has no current book, etc. Are there any new units you’re hoping to get added to factions? Mitch: We’re always looking back at old races, and of course we see the things we could add, and that people want us to add. It’s a fine balancing act between spending our limited time on units for the DLCs we’re making and putting in free updates where possible. Can you explain to me why CA has been so reluctant on Legendary Heroes and if there are plans for the future to include these? Mitch: There is no hatred for Legendary Heroes for sure, I think it is purely the case that making a character of such detail is a big-time cost: art, animation, audio, voice acting, etc, etc. So generally spending that time on such a thing will result in us wanting to get the best bang for buck from that, that means making them a Lord. Could this not be used as an argument in favour for Legendary Heroes? Mitch: Well we have to fit Lords and the unit roster into our budget, and put bluntly Legendary Heroes could take away from one of those, and I think more people would prefer the units or Lords. It’s tough, though, because I know people want Heroes! Is increasing the Trait limit for Lords something you might prod at? Mitch: We have done a few times. It was around 10, then we upped to 30, now it’s at 50 currently. When designing a Lord Pack, how do you pick which units get in and which ones don’t? Mitch: Primarily it’s a design choice based on how we want the roster to play, key units that we think are needed to let the faction achieve that playstyle, then of course we have to add on top of that time constraints as well as having the people to actually do the work, which is all a fine balancing act. In a similar vein, how do you pick which Lords get added as FLC? Why do you sometimes pick relatively irrelevant characters over ones with a more significant presence in the lore or in the tabletop game? Mitch: We’re generally pretty freeform with Lords – what Lords we think we can make an interesting pack with is the primary focus, as well as theming for our usual theme of head-to-head style Lord Packs with two lords facing off. Why did you decide to do a Campaign Pack before the next Lord Pack? This means that we will have to wait for quite a long time with Skaven and Lizards being incomplete and Lizards really need something right now. Rob: We’d just done a Lord Pack and had the opportunity to do something pretty great for a Campaign Pack (at least we think so). We will get back to the Skaven and Lizardmen, yes-yes. Can we expect a rework of Grimgor Ironhide? He is currently rather weak and this doesn’t fit well thematically. Mitch: We’re aware Grimgor (and a few other Lords) are a bit weak in battle at the moment, and will be looking at that for the next release. Do you understand the problem the community have with tying major bug fixes to new content? Do you think it’s a good idea to have major bugs staying in game for several months because of this policy? Rich: To answer your question simply, yes we do, but at this moment in time our policy is to release a patch update with bug fixes and balancing adjustments alongside a new DLC product. The exception to this as you have seen post release of the Queen & the Crone is that we sometimes follow up with a special content drop (Kharibdyss) and/or a hotfix patch. Now this further patching isn’t something you should expect to see with each product and therefore our approach is still to try to squeeze as many fixes and balance updates in as possible alongside each new content update that we create. A big reason for taking this approach is that it allows us to keep all of our data and codebase structures stable in one place for as long as possible. This is vitally important for when we branch to a new project (e.g. 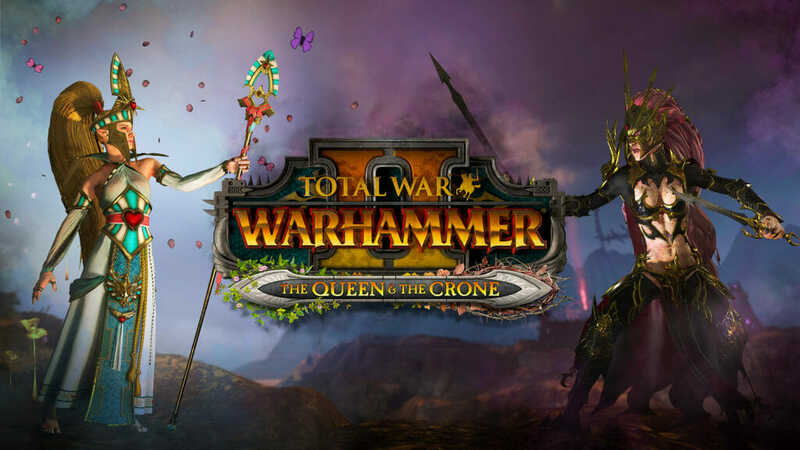 Tomb Kings to Queen & Crone), as it keeps the core of the game intact for us to build upon, rather than having the data and code split in two branches which will need to be integrated again at a later date. Thus maintaining and integrating the code and data between multiple branches at once has a significant cost overhead and greatly reduces our time in either being able to create more new content for future products or fixing additional issues in a single live branch. Likewise we would end up splitting our QA capacity to test both the update patch and the new content, so all in all keeping our changes in one place has the net result in getting you the new content sooner along with the bug fixes we have, rather than splitting them up into separate updates and slowing the overall process down. I hope this provides a better idea of our thinking and why bug fixes come with major updates. Rob: Absolutely we’re aware that the community would like some fixes, we always are, rest assured. Rich says similar elsewhere in this thread, but is worth saying that there’s no hard ‘policy’ to do this, as you can see from all the times we’ve updated games before. We go for a mix of game updates when DLCs arrive and hotfixing the game should something major occur that needs addressing outside a larger update. Appreciate it’s probably semantics from a players’ point of view, but to us DLCs give us a major opportunity to update the game rather than vice versa, and by planning a patch alongside it gives us the opportunity to maximise the effort going in i.e. we don’t make a bunch of changes that then shortly need to be changed again and may throw up further bugs, and we can double up on the testing effort etc. Situation we have right now is a bunch of things we agree need fixing up (thanks to those guys who have supplied a bug list, we’re aware of all of them), but for the vast majority we consider them appropriate to include in the next major update, because that fix is already in the code branch or the system/unit in question might be under review. The one thing we really aren’t ok with leaving is the reinforcement bug, which we agree is particularly annoying. So next week we’ll upload a beta patch so you can opt into that fix if you prefer. We will certainly continue to read your feedback and check out the in-game stats, otherwise, due to the size of the next update, we will be rolling those other smaller fixes into our plans for that. Rob: Yes. Any that are posted on our support forum are being looked into. We can’t say if any are fixed, though, until patch notes are out. Can and will you stop binding bug fixes (reinforcement bug, for example) to DLC releases? Rich: On the reinforcement issue, I’m pleased to say that we will be putting out a public beta update to address this issue very soon. More news on this to follow through our usual information channels. Does this mean the patch is planned to go official before next DLC? Rich: Yes, this will be before the next DLC. Can you please put two (more) of your new content devs on bugfix duty for a while? So they can fix stuff? Despite all the complaining here about the lack of new content, personally I crave way more for bugfixes. That you cannot build occupied Hellpit main settlements (as Empire, for example) without Tomb Kings DLC sounds like a small thing, but as you don’t fix it, it looks like you are trying to force me to buy Tomb Kings DLC. It’s a bug in the game since TK release. Rich: Thanks for bringing this to my attention. We will certainly look to tackle that issue and have it resolved for the next major update – I hope it hasn’t affected your enjoyment of the game too much. Will the loyalty event bugs and reinforcement bugs be fixed? Also will the Sisters of Avelorn voice line issue get fixed? Mitch: The loyalty events and reinforcement bug will be fixed, reinforcement one soonish! The latter I’ve not heard of so please go report it on our forums! Thanks. Will you consider supporting the WARHAMMER trilogy with continued DLC long after the final instalment, akin to ROME II’s resurgence in new content? Between games such as Fatshark’s Vermintide series and Cubicle 7’s WFRP 4th Edition, the Fantasy setting is continuing to expand ever-onward while still retaining its own identity. Total War has proven itself to be a definitive depiction of WARHAMMER Fantasy and I’m sure many people would be enthused to support keeping it as such as time marches on. Rob: We certainly intend to. If people continue to play and enjoy it, there’s no reason why not. WARHAMMER I got a campaign starting screen overhaul – any chance we’ll get one for WARHHAMER II so we can see where in the world our chosen Lord/Race/Faction starts? Mitch: We’re really not happy with the current situation with the impossibly long list of Mortal Empire Lords, as well as the lack of certain information like start locations. It’s a big task to rework the UI, however, so when we plan to make changes I can’t comment but they are planned. Are there any plans to add more regions settlements to the Mortal Empires map? Will the Warhammer series continue to receive content even years after release, like Rome 2 is right now? Mitch: Really hard to say what will happen that far in the future. I guess as ROME II, shows anything is possible. Rob: We certainly intend it to. ROME II was released several years ago and still receives continuous DLC updates, something I think a lot of historical fans praise (I know I do). My question here is: speaking in the long term, what would have to happen for WARHAMMER to reach that level of long-reaching support? Mitch: It’s tough to say what will happen such a far time in the future is the honest answer here. So what kind of communication does the team have with the WARHAMMER team? What kind of concepts get talked about or are you all kept separate for the most part? Mitch: The WARHAMMER teams are always in touch – we sit right next to each other a row over! Generally, though, I think its fair to say we think it’s a good idea that teams retain independence. Of course, we do DLC 100% of our time, so I wouldn’t want to just go interfere in something they’re working on without being fully invested in all of the thought processes that got them to where they are in their line of thinking for their design. Likewise we can’t just have someone come over to DLC and be like “You should change that” – our development process in terms of design is extremely iterative, so it’s really important to maintain team cohesion. Of course, though we throw ideas at each other, help each other out with work, etc., etc., but we’re distinct teams for most of the time. Was this type of work practice not identified as the root cause of the Norsca in Mortal Empires fiasco? Going forward, how do you ensure that any DLC you create for TOTAL WAR: WARHAMMER II is going to be compatible with future Total War: WARHAMMER campaigns? Mitch: I’m talking only about design. The Norsca integration was a production/technical issue that is unrelated to how much impact our design influence has on either teams’ current project. Is there any metadata you guys have on which campaigns people play? For example, Mortal Empires, Vortex, etc. If so what are the statistics? Mitch: We have all the metrics. 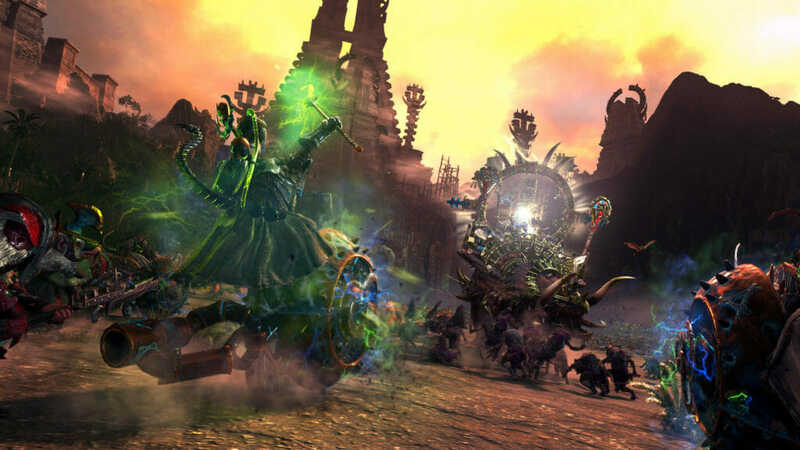 For instance, 8.7 million Mortal Empires campaigns started, and 7.6 million Vortex campaigns. Pretty even. What was the last mod that made you think “Damn, we should’ve done that?” Also what was the last mode that changed your schedule (“Oh, we were gonna do that, but the modders have it covered so let’s work on something else”)? I can’t say we’ve ever changed plans based on mods, though. Firstly, that’d be crazy in terms of production. Secondly, I feel like we can always do things different, and also do things mods can’t do without big edits to our code that we can. What’s the first thing you do after deciding the Campaign Pack? Concept art? Mechanics? Mitch: The art side will begin doing concepting and design will start throwing around crazy ideas about the mechanics and storyline. That’s step one. A while back ago there was a debate in which some made note of the fact that WARHAMMER II sold less copies than WARHAMMER I (so far) and called the second game unsuccessful. Others, including myself, argued otherwise (I personally consider WARHAMMER II the most successful Total War expansion so far). From your perspective, is Warhammer II a successful game? Mitch: Don’t worry – WARHAMMER II is definitely successful from our point of view, as is the DLC we’ve done. The Goldilocks question: most WARHAMMER fans I have seen on these forums have expressed frustration regarding the content release schedule, notably the repeated several month droughts. These fans remember well the days of the first game, where DLC came at a much more rapid-fire pace. However, I have seen reports that some fans did not like the rapid release schedule of WARHAMMER I. Thus, my question is, if the content release schedule for WARHAMMER II was too fast and the release schedule for WARHAMMER II was too slow, how will the team aim for a “Goldilocks” solution going forward? Mitch: We posted about this recently, but the TL;DR answer is the WARHAMMER I DLC was quicker to make because it took less to do it. 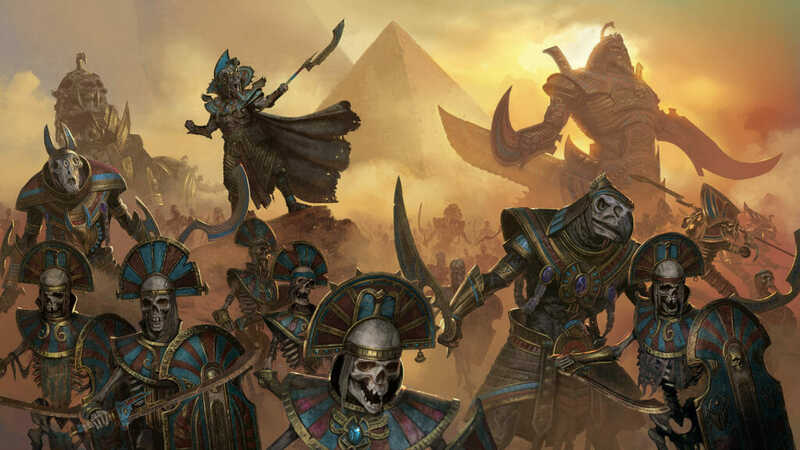 Tomb Kings has its full roster, for example, because we know people want that, we have to put Tomb Kings into two full campaigns, there are more – and far more complex – mechanics in Tomb Kings than any other. This is stuff people want and obviously it takes time, and I think most people understand that, thankfully. We’re just as a community going to have to highlight the logistics to those who want the higher quality content quicker – it just doesn’t work that way. What criteria do you guys use to decide when to conform with lore and when to ignore it? I know there are some things like Bretonnia where you felt like the roster needed to be bigger so you invented your own stuff, but what was the justification behind decisions like making Marauder Champions instead of the lore-based Huskarls, or turning the war for Eight Peaks into a race instead of the in-universe dynamic of Belegar and Queek trying to oust Skarsnik? Mitch: We always start by looking at the lore, but of course we have to consider the gameplay – and those two things don’t always agree. You provided a perfect example – of course we know Skarsnik and Belegar should both “start” at Eight Peaks, but the reality is that that would be a campaign with a single battle, so gameplay triumphs and we change things up to suit gameplay we think will work. As it takes longer time to create new content, have you ever thought about hiring new people? Rob: We’re hiring all the time at CA, and the New Content Team is getting larger all the time, too. We were joined by another designer and coder last month. The New Content Team maybe twice the size it was when we were making ROME II DLC – we’re probably getting up to the size of the team that originally made ROME: Total War these days.